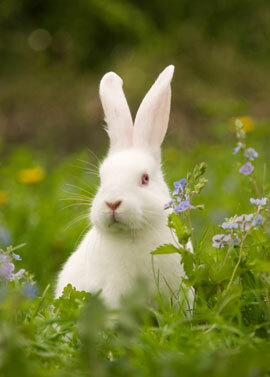 Happy Easter Rabbit Rabbit Fool’s Day! because it’s the first of April! Happy April Fool’s Day too to all of you! Wow it’s a banner day with three ‘holidays’ on the same day! Woo Hoo! I awoke this morning and saw sweet Clover hopping by! I love how he arrived to greet me on this special day! By the way, I heard we are to have snow tomorrow. What a funny April Fool’s joke Mother Nature! I hope she’s kidding, but it’s not looking like a joke! I hope that you have a beautiful day filled with love, peace, joy and togetherness with those whom you love! Enjoy every precious moment! God Bless and Shine On! P.S. This photo is thanks to sweet Rhonda compliments of The Path Through The Woods on Facebook. May Your Easter Be Filled With JOY! Easter is a natural time of rebirth. As Spring begins its season of growth, so do we! Gratitude for blessings and delighting in the wondrous emergence of flowers and trees budding in the Spring flows joy to our hearts! How lovely for the change of seasons! May you enjoy a few moments of quiet today to fill your heart with love and gratitude. Pray, meditate and just enjoy this moment in time. Fill your day with love, reach out to family and friends in kindness and be gently reminded of the great gift that is today. May joy be yours dear friends! What first ‘caught my eye’ (ahem ~ sorry couldn’t resist) with this card was the EYE and that the quote was attributed to Anne Frank. Being familiar with her famous circumstances, I find her simple truth quite fascinating. 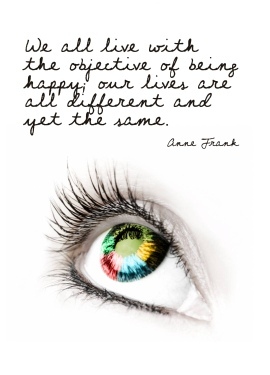 “All different and yet the same,” speaks to me as well…we are connected and have the similar objective of happiness. Happiness is something we talk about in our daily lives ~ we use the word HAPPY all the time ~ Happy Birthday, Happy Anniversary, Happy New Year, Happy Valentine’s Day, Happy Easter, Happy St Patrick’s Day, etc. For a moment, just think about this ~ What is “Being Happy” to you? Is it peace of mind and body? Is it financial freedom? Is it an abundance of Health? Love? Freedom? Are you happy right now? Is it something you have or something that eludes you? How do you feel about happiness? That’s your mantra for today. And that is my hope for you as well. I know no thing so wondrous fair, No miracle so strangely rare. The sunlight is dappled across my green lawn as I look outside this morning ~ and I see the tiny buds on the bushes, trees and flowers and I am in awe. Spring has Sprung! And it’s Passover and Easter…rebirth, renewal and family all rolled into one! I love all of the seasons, but Spring has a special place in my heart. I love the idea that a small seed can grow with love, sunshine and water into a beautiful flower, a sturdy tree and even a beautiful, powerful, loving, caring human who simply by ‘being’ makes this world a better place to live! A seed can blossom into an idea which changes the world…one thought can SPRING into action which changes your life! Look around today in awe at the beautiful Spring emerging in your world. 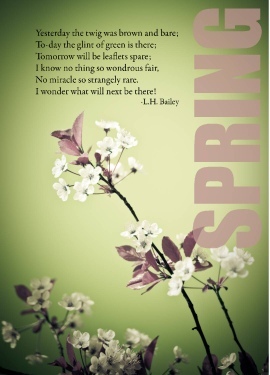 Check the skies, check the earth, check yourself…be excited…Spring is here my friends! May you have a Spring in your step today! What I adore about the month of December is the daily anticipation that it brings…because many days, nestled alongside the junk mail and bills is a white envelope or two. In those envelopes are unexpected surprises ~ notes and pictures from friends wishing us a Merry Christmas and a Happy New Year! I don’t know about you, but I love to get a card in the mail ~ that connection that it makes between the giver and the receiver…the physical showing that I THOUGHT OF YOU ~ means so much! With this is mind, if you are so inclined…check out my video of some of the cards you can send via your computer, writing your heartfelt message, even including pictures ~ all for less than $1 a card (plus .45 postage). Either way, Happy Monday and Happy Easter to you!